The 2018 league tables published by Brand Finance, Forbes, Interbrand and Millward Brown make for depressing reading for anyone hoping for consistent, definitive data on the importance of brand. As standalone studies, each league table is well conceived and executed. The problem begins when you start to compare the data across the different lists. The first issue is the lack of consensus on which are the most valuable brands in the world. The table above shows the top 30 brands according to each provider. The lists contain a total of 60 brands and only 5 brands are common to all four lists (Amazon, Apple, Facebook, Google and Microsoft) while 24 brands appear on only one list. 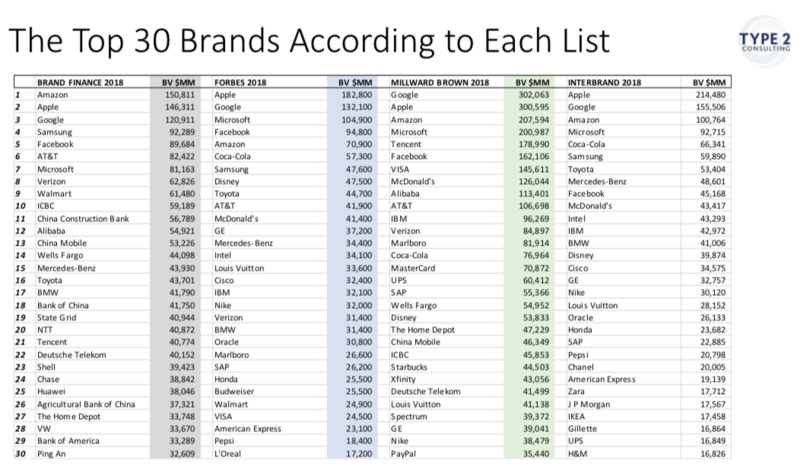 Extending this analysis to the full 100 brands on each list reveals that only 35 brands are common to all four Top 100 lists. The four lists contain a total of 187 brands, of which 78 appear on only one list. Among the 35 common brands, there is a wide divergence about what they are worth in aggregate – Forbes values them at an aggregate $1.56 trillion whereas Millward Brown (whose list is published barely a month later) gives the same 35 brands an aggregate value of $2.36 trillion (75% greater). The variance in valuation is even more extreme at the individual brand level – the values of the McDonald’s, Starbucks and UPS brands all differ by a factor of more than 4 times! For example, Brand Finance values the McDonald’s brand at $25 billion – Millward Brown values the same brand at $126 billion. Perhaps most worrying of all is the lack of consensus about whether a given brand had increased or decreased in value relative to 2017. The four providers were only in agreement on 17 of the 35 common brands. For the other 18 brands, the four providers held opposing opinions about whether the same brand had increased or decreased in value over the preceding 12 months. The story is similar at the aggregate level. Millward Brown’s Top 100 brands have a total value of $4.38 trillion, with the top 30 brands representing 48% of this total. By contrast, Interbrand’s Top 100 brands sum to “only” $2.02 trillion, but their top 30 represent 67% of the total. The differences between the league tables have been increasing over recent years. The number of brands unique to just one list has risen from 67 in 2016 to 76 in 2017 to 78 in 2018. Similarly the difference between the value of the brands on the Millward Brown list and those on the Interbrand list has risen from 87% in 2016 to 94% in 2017 to 117% this year. What is going on here? How can four credible publishers/agencies using essentially similar valuation approaches produce such divergent results? One reason might be that they differ in their definition of “brand” – Brand Finance says that its valuations are based on the trademark and associated goodwill (in other words, the intellectual property that anchors the brand). The other three providers are less explicit about their definition of brand but the description of their methodologies imply that their valuations represent the entire economic impact of “brandedness” on performance. Notwithstanding that Brand Finance uses a more restrictive definition of brand, its valuations are significantly higher than those of Forbes and Interbrand. Millward Brown uses the same methodology as Interbrand but produces valuations that are consistently nearly twice as high. The inescapable conclusion is that these valuation differences reflect the differences of opinion between the four providers about the importance of the role that brands play in influencing customer choice and driving cash flow. But even here, there is inconsistency. As noted above, Millward Brown is by far the most bullish about the role of brand. However, regarding the valuation of automotive brands such as BMW, Honda, Mercedes and Toyota, Millward Brown’s valuation of these brands is significantly below those of the other three providers. This inconsistency creates a problem for marketers who want to use these brand lists to demonstrate the economic significance of brands to their CFOs and finance departments. Instead, these list demonstrate that brand valuation remains in its infancy as a discipline and that, for now, we should be wary of giving too much credibility to the valuations they contain. Jonathan Knowles is an acknowledged authority on the role of brands in business strategy (known as “marketing finance”) – specifically on the topics of customer value creation, brand strategy during mergers, marketing accountability, and the analysis of intangible value. He is the Founder and CEO of Type 2 Consulting, and has a background in Finance (Bank of England), Strategy Consulting (Marakon Associates), Creative Brand Strategy (Wolff Olins), Brand Equity Measurement (Stern Stewart/Y&R’s BrandEconomics) and Brand Valuation (Brand Finance). His articles have appeared in Harvard Business Review, Sloan Management Review, the Wall Street Journal and other publications.